Water On Mars – Otherwordly Skill | Love Productions Inc. 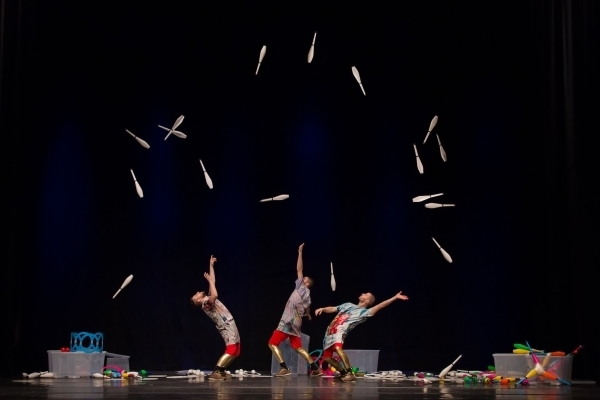 The Swedish trio Plastic Boom’s U.S. premiere, Water on Mars, provides an infectiously joyful juggling exhibition. One of the 2018 Philadelphia International Festival of the Arts’ events, Wes Peden, Tony Pezzo, and Patrik Elmnert make magic with a plethora of props, involving the audience in on the fun without uttering a word. The Kimmel Center’s Perelman Theater stage holds a big circle of jugglers’ props: pins, rings, balls, and many other objects. At the center sits a colorful piñata, ready to be hoisted in the air. The bearded performers wear airbrushed long T-shirts, red shorts, gold leggings, and sneakers and perform to fast-driving throbbing music with skillful synchronicity and seemingly effortless bliss. I seldom use the word amazing, saving it for what truly astounds, but Plastic Boom’s amazing, amazing, amazing feats of throwing and catching emerge from a spirited “Hey, how about this?” collaborative approach. One expert juggler gets challenged by his friend: Can you do that with this clear plastic storage bin over your head and upper torso? Can you careen balls off the bin and catch them? Can you aim them into the bin and catch them as they bounce out? Can you juggle while standing in the bin and being pushed across the stage? Can you juggle while being wrapped in packing tape? The answer, of course, is always yes. Yes! They juggle not only balls, pins, and rings but bunches of pins taped together, bags of candy, rolls of toilet paper, their shoes and shirts, and open bottles of water — a tricky and messy endeavor, but surprisingly beautiful. Fireworks are the best analogy for their extraordinary displays of skill: their objects, and sometimes their bodies, explode upward gloriously in colorful visual cacophony. The audience becomes involved in an elaborate card trick. Some lucky front-row people get balls to throw into the finale’s maelstrom of flying objects. The piñata finally bursts and candy rains down. The trio even run through the house throwing things over our heads. Seldom does sitting for a performance feel so active. Though Mars is never directly referenced, the show’s title provokes cosmic thoughts. Water on Mars shows humans doing what we’ve always dreamed of: escaping gravity. Yet Plastic Boom expertly works with Earth’s gravity, making it seem less restraining. Mars’s surface gravity is only 38 percent of Earth’s; these three young men appear to be juggling on Mars. What a joy to see such low-tech, hand-wrought skill and grace in our over-computerized age! What a shame — as in, how shameful — that some people witnessing it chose to flout the house rules and all standards of theater decency to raise their smartphones, blocking others’ view, recording instead of enjoying the magic in the moment. On Earth, water is commonplace. If Mars had water, of course, it could be livable, maybe an Earthlike paradise. Water on Mars suggests miraculous transformation, making the impossible happen, shaping fantasy into reality.